Bitmap Bureau has revealed that Xeno Crisis - an arcade-style shooter set to launch for the 30-year-old Sega Mega Drive - will also be receiving a physical release on Nintendo Switch. You may remember that, right at the start of the year, we reported on the game's Kickstarter progress, noting that a $65,000 stretch goal was needed to secure a Switch version. Well, that goal was comfortably met and a Switch version has been confirmed for some time, but a much-wanted physical edition for Nintendo's platform was never an absolute certainty. Thankfully, for those who were desperate for a cartridge version, that physical edition is now confirmed to be on the way. 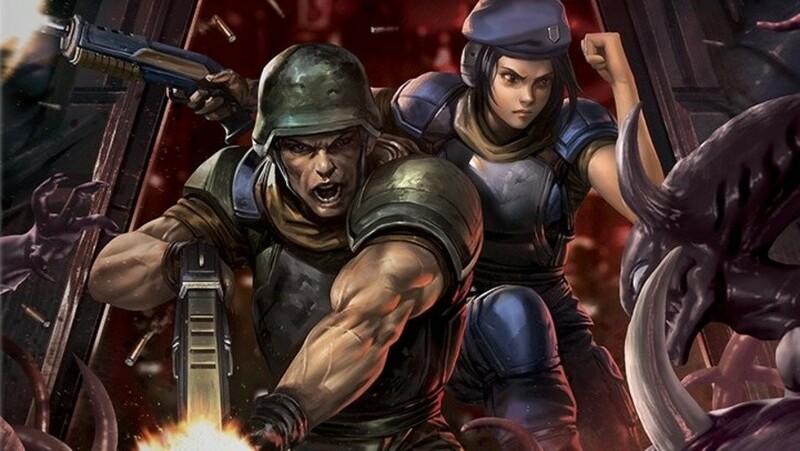 The game is an arena shooter for up to two players that takes inspiration from the likes of Smash TV, Contra, Mercs, Granada, Alien Syndrome, Zombies Ate My Neighbours, Chaos Engine, and Shock Troopers. If you missed the Kickstarter campaign earlier in the year but are interested in learning more or pre-ordering a copy on Switch, you can do just that via the old funding page. Will this one be joining your physical collection? I was just thinking about this game the other day. I'll be picking it up day one whenever that day may be, can't wait. Hopefully it's succesful and leads the devs to creating another Bitmap Brothers inspired game, the long overdue spiritual successor to the greatest 'future sports' game ever made, Speedball 2 : Brutal Deluxe. Do you have to reserve a copy or something? If so where? Zombies an arena shooter? Pushing it there. I was hoping it would get a real physical release. I guess I'll have to go digital then. @Bunkerneath I used to play it on my mate's Amiga and then got it for the Megadrive. It was without doubt one of my most played games on the console. I played it via emulation on Wii a few years ago and it's held up very well. A modern HD version with a deeper career mode and online play is begging to be made. Just as long as they don't tamper with the rules and gameplay, as those are perfect. There was a 'modern' Speedball on Xbox 360 I believe and it was supposed to be a mess. Nice. Those boxes look great. I've already backed the MegaDrive cart version (not long to go until release now) but may just pick up the Switch version as well for some mobile gaming. Also backed the Tanglewood cart for the MegaDrive which is also imminent. Who'd of thought back in the early 90's that new games would be released for the system 30 years in the future! @Bunkerneath Wow - another person raised on Acorn Archimedes games! It did get occasional conversions of popular 16 bit games back in the day. I loved "Gods". Must admit I never got to try Speedball 2. "RealStrictlyLTD" How many of these "rare game" companies are there? Do you know, @ogo79 ? "Mega Drive Kickstarter Success... "
What is Jill Valentine doing on the cover? @KingMike Limited Run Games, Strictly Limited Games, Special Reserve Games, Eastasiasoft, Super Rare Games, Red Art Games, Hard Copy Games, FanGamer, VBlank, iam8bit, Signature Edition Games, and Game Fairy. So 12 apparently. @Rutta Strictly Limited Games are doing the physical copies, but preorders aren't up yet. @8itmap_k1d same here where is the order options? those "limited physical editions" are dumb. I still need to purchase the ROM version of this game to put on my SNES Classic. Bitmap Bureau ? Are they related to the Bitmap Brothers ? @PCkid @Bunkerneath We're big fans of the Bitmap Brothers but we don't have anything to do with them - you'll see some influence from The Chaos Engine / Soldiers Of Fortune in Xeno Crisis though. @NinChocolate Oh we mention Henk whenever we can! @BitmapBureau Thanks, but I hope you do know that I was just kidding. In all seriousness, I actually find it pretty admirable that companies still support older consoles like that. From the looks of it, you guys did a great job, though, and I love how the game looks. Unfortunately, I haven't got a Megadrive, so I'll be putting the Switch version on my wanted list instead. @ThanosReXXX I should know at my age really! I'm sure you'll enjoy the Switch version - it plays great! Thanks for your support. So when will we get a Physical order option link? Still looking and waiting?? @BitmapBureau does the game release at the same time digitally on PS4? And also any information regarding the price? Also can you tell me what engine are you using? Your game is an absolute day 1 for me. @BionicDodo That's a great list of games, many of which I enjoyed back in the day. Must rescue my A420 from my parents loft. I gather the Raspberry Pi can run RiscOS natively and some developers have kindly released ROMs so that these old games can be played with their blessing. Will have to look into that! @Blister Yes, it seems like lots of games have been made available for free. Sadly, nothing by The Fourth Dimension yet. @BionicDodo thanks for the link! @Axlroselm Yes we're looking to release the game more or less simultaneously across all platforms - I expect SLG will be announcing the price soon. @NinChocolate He's only joined Twitter fairly recently, but Henk is an absolute legend and one of the greatest pixel artist around - wait until you see what he has lined up next.